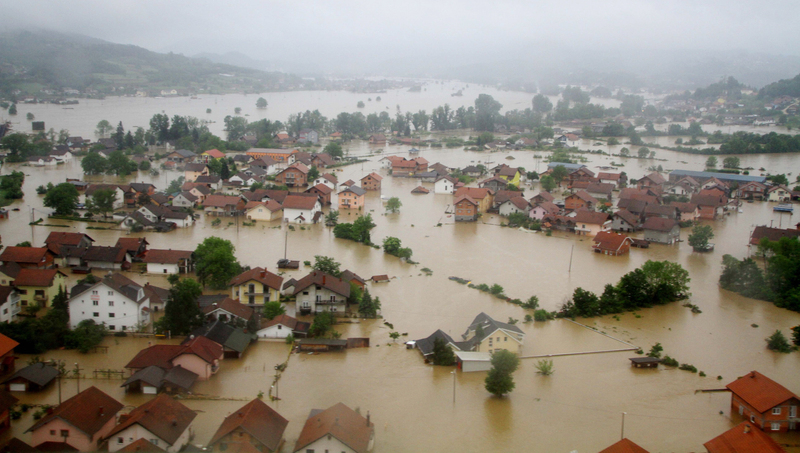 The Balkans recently experienced the heaviest rains in 120 years of recorded weather measurements, causing massive flooding and powerful landslides. My colleague Haris Balta, a certified UAV pilot with the European Union’s ICARUS Unmanned Search & Rescue Project (and a member of the Humanitarian UAV Network, UAViators), was deployed to Bosnia to support relief efforts. During this time, another colleague, Peter Spruyt from the European Commission (DG JRC), was also deployed to the region to carry out a post-disaster needs assessment using UAVs. Haris, who also works at the intersection of robotics and demining, was asked by the Government of the Federation of Bosnia and Herzegovina to identify the location of mines displaced due to the major flooding and mudslides. As it turns out, some mines were displaced as far as 23 kilometers. When the flood waters subsided and villagers returned, most were unaware of this imminent danger. Haris used a rotary-wing UAV (the quadcopter pictured below) and logged some 20 flights (both manual and autonomous) at more than a dozen locations. The purpose of these flights was to capture imagery that could be used to identify displaced land mines and to analyze the effects of landslides on other explosive remnants of war. Haris and team created 3D maps from the imagery and used geo-statistical modeling to try and determine in which direction land mines may have been displaced. The imagery also provided valuable information on dyke-breaches and other types of infrastructure damage. Meanwhile, my colleague Peter from DG JRC (who is also a member of the Humanitarian UAV Network) flew a light fixed-wing UAV in five locations to support damage and needs assessments in close collaboration with the World Bank and the UN. According to Peter, both local and regional authorities were very supportive. Some of the resulting images and models of landslide areas are depicted below, courtesy of DG JRC (click to enlarge). I just introduced Peter and Haris since they weren’t aware of each other’s respective efforts. If you’re participating in humanitarian UAV missions, please consider sharing you work with the Humanitarian UAV Network by posting a quick summary of your mission to the Network’s Operations page; even a one-sentence description will go a long way to facilitate information sharing. This entry was posted in Drones/UAVs, Humanitarian Technologies and tagged Balkans, floods, ICARUS, JRC, Mudslides. Bookmark the permalink. Thanks Jelenko, feel free to cross post and link back to iRevolution.